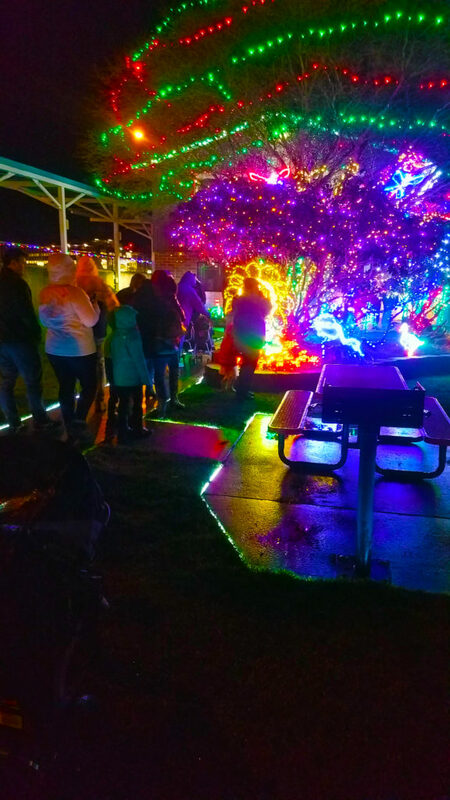 At 5 p.m. Dec. 2, Santa Claus said the magic words and turned Kingston’s marina park into a Kingston Cove Christmas wonderland. Six hundred luminary sculptures sprang to light, including a sea serpent whose loops were big enough for small children to walk under. Over 500,000 lights and three-quarters of a mile of rope lighting illuminated trees, railings, pathways and bushes in the park. A 40-foot Christmas tree was all a-glow and the marina was a festive forest of lighted masts. Work on this year’s lights began last March. That’s when Port staff member Steve von Marenholtz started designing and welding up the steel wire-frame skeletons for this year’s new light sculptures including a jack-in-the-box and a sailboat. Since September, 13 volunteers have been adding lights to those sculptures and repairing the lights on older ones. 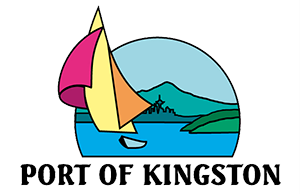 Meanwhile seven members of the port staff have been putting up the lights with the assistance of members of the Kingston High School Honor Society. This marks the third year the students have been involved with the lights said Honors Society Advisor Terry Darrow. “All told, it probably takes a thousand hours [of staff and volunteer time] from start to finish,” said staff member Raymond Carpenter who oversees the annual effort. The lighting ceremony was the culmination of a day-long series of events and activities that took place on Dec. 2. 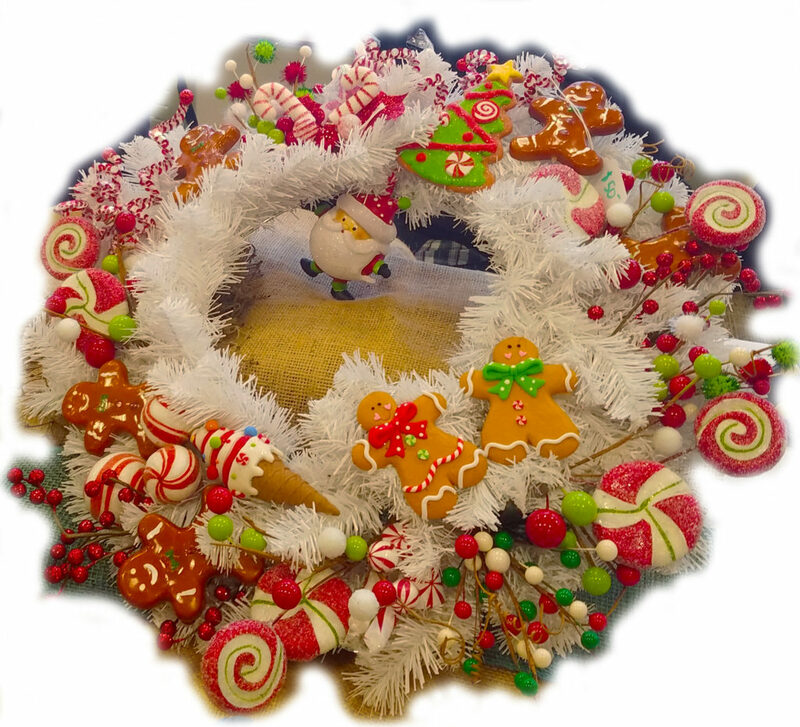 The day’s events began with the Festival of Trees and Holiday Gift Fair from 10 a.m. to 3 p.m. at the Village Green Community Center, 26159 Dulay Road NE. This marked the second year for this event that featured a silent auction of donated trees decorated by local businesses and artists. The proceeds went to the Village Green Foundation, according to Mary McClure, the Foundation president. The Gift Fair featured 30 booths including one demonstrating a hand-cranked machine that volunteers used to knit socks for the troops in World War I. Ten Kiwanis members and six to eight members of the Kingston High School Key club staffed the Kiwanis’ Santa’s workshop at the Kingston Cove Yacht Club, 25878 Washington Blvd. NE, adjacent to the marina park. “Our focus is serving children in our community,” said Ron Shoaf, president of the Greater Kingston Kiwanis Club. A free event, youngsters were able to visit with Mr. and Mrs. Claus while their grown ups took pictures. Then the youngsters made presents — Christmas ornaments, greeting cards and decorations — for family members and friends. The youngsters couldn’t be left unattended, but often one family member stayed with a group of youngsters, so the other adult members were freed up to shop, and visit food vendors and the Chamber of Commerce’s wine and beer garden, that was staffed by another 10 or so volunteers. 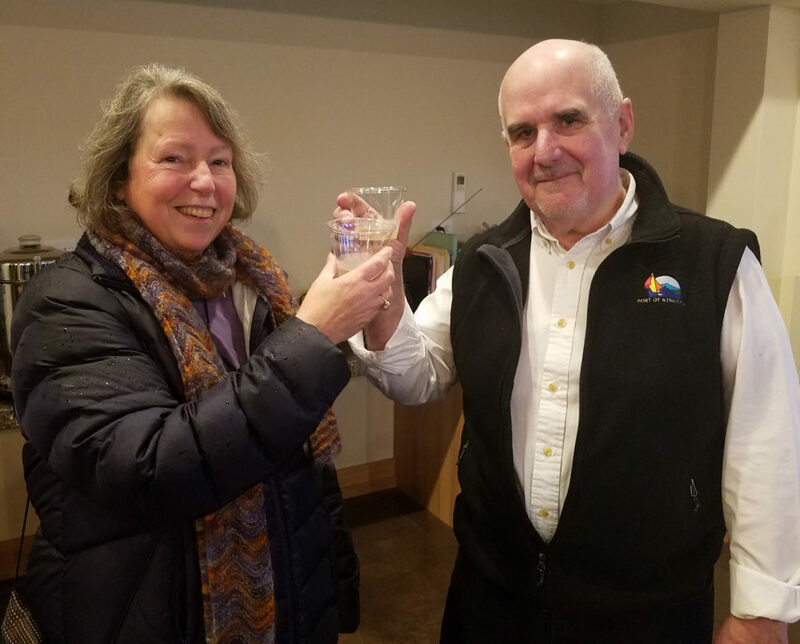 About 50 people braved the rain for the 3 p.m. Chamber of Commerce ribbon-cutting ceremony for the Port’s new office, then toasted the new addition with champagne and hot apple cider. The 900 square-foot, ground-level reception area features an exhibit of historic photographs from the Kingston Historical Society. From 3:30 – 4:30 p.m., 20 members of the Kingston High School Jazz Band and Choir, under the baton of Thomas Guenther, director of bands, choir, and recording arts, performed in the pavilion in marina park. At 4:30 p.m., Elvis impersonator Danny Vernon performed some of Presley’s most popular songs. The music had small children gyrating in the aisles and older grown ups singing along. 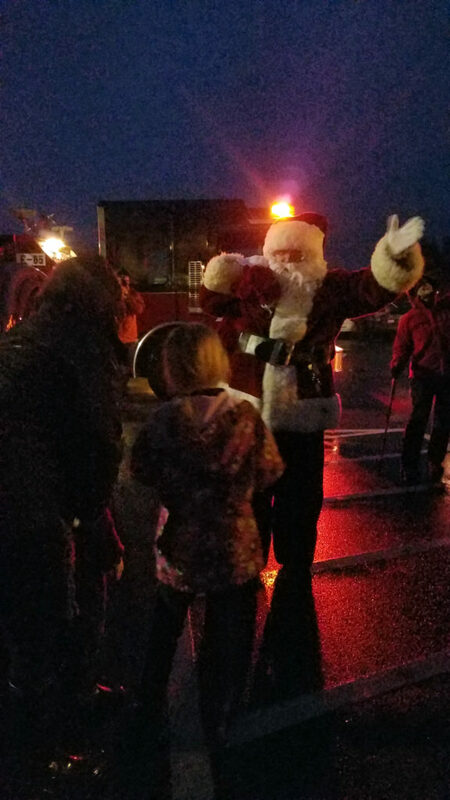 At 5 p.m. Santa Claus arrived riding in the cab of an NKF&R fire engine. “Santa was awesome,” said Carey. Then Santa said the magic words and the park and marina sprang to light. 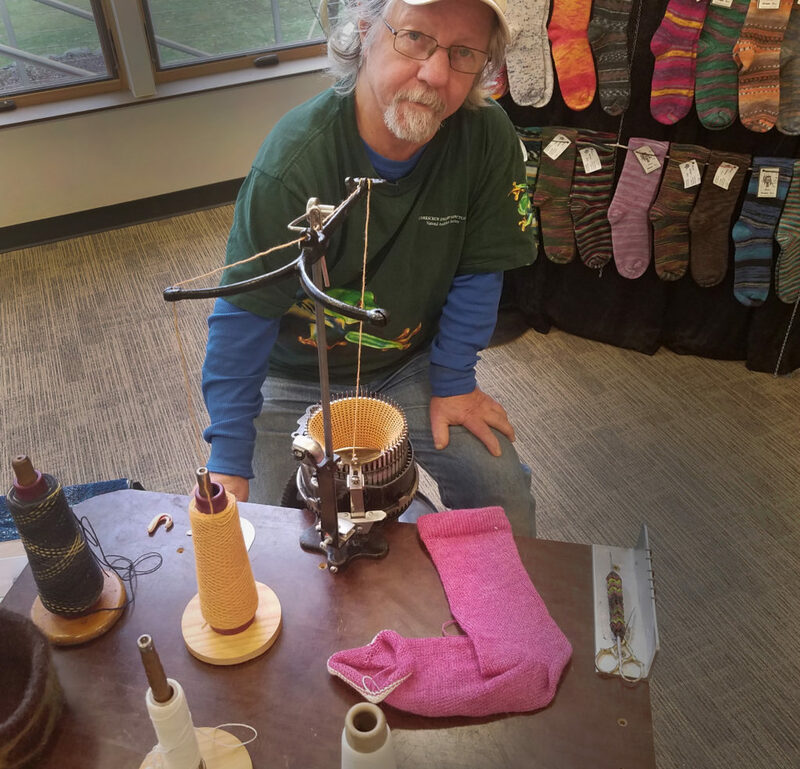 Photo: The Village Green Holiday Gift Fair featured 30 booths including one demonstrating a hand-cranked machine that volunteers used to knit socks for the troops in World War I. 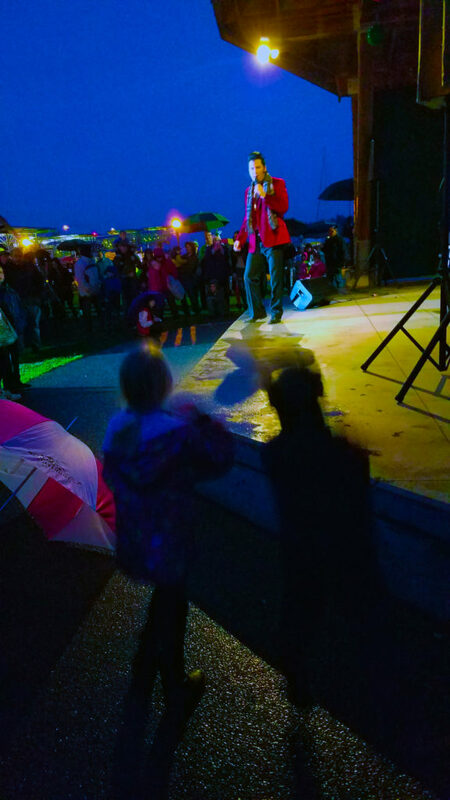 Photo: Elvis impersonator Danny Vernon had small children dancing and grown ups singing along.